FILE - A Terminal High Altitude Area Defense (THAAD) interceptor is launched during a successful intercept test, in this undated handout photo provided by the U.S. Department of Defense. A top U.S. official says Washington still hopes to hold a dialogue with Beijing on the possible deployment of an advanced missile defense system, known as THAAD, in South Korea. At an Air Force Association policy seminar Thursday in Washington's Capitol Hill neighborhood, Assistant Secretary of State Frank Rose reiterated the assertion that THAAD would be deployed solely to defend against growing nuclear and missile threats from North Korea. "As long as North Korea continues to develop, test and deploy ballistic missiles, we will work with allies and friends in the region to defend against that threat, including through the deployment of an effective missile defense," he said. U.S. officials say the anti-missile system manufactured by Lockheed Martin is equipped with a radar that can track targets some 2,000 kilometers away. The system's ability to intercept enemy missiles fills a gap in the current missile defense system deployed on the Korean Peninsula. The deployment, however, has encountered strong opposition from China, which is concerned that THAAD will undermine the strategic deterrence of China's long- and mid-range missiles, as well as the regional military balance. Rose also said the United States understands China's concerns, and has always hoped to explain that the deployment will not affect China's strategic deterrent. 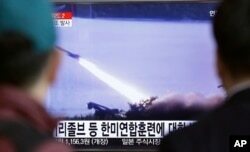 "THAAD's single-stage interceptors deployed in [South Korea] would not have the range or capability to intercept Chinese ICBMs headed to the United States," he said. "It is pure physics." According to some Chinese security experts, Beijing is more concerned about THAAD's X-band radar system, which they believe will cover a large area of China and hurt China's strategic ability to fight back. Rose said the new missile defense system will not affect the U.S. ability to detect Chinese strategic nuclear missiles, since "the United States already has two similar radars in Japan, and we have a number of other sensor capabilities in the region, including the sea-based X-Band Radar, and the Cobra Dane radar in the Aleutian Islands." Rose also says the U.S. has been seeking dialogue on the issues with China, but China has continued to decline the offer. Meanwhile, Beijing and Moscow announced a joint missile exercise this month, a move widely viewed to be their response to the possible THAAD deployment in South Korea. "The possibility of Chinese and Russian strategic force cooperation against the United States is a real possibility, and the United States needs to start preparing for such possibility," said Richard Fisher, an Asian military affairs expert at Washington-based International Assessment and Strategy Center. U.S. officials said that, at present, the United States missile defense system is mainly directed against missile threats from rogue states such as Iran and North Korea, and its size and capabilities are not sufficient to resist the strategic missile threats from China and Russia.